This is a post sponsored by DIYdecorstore.com. I received product and/or monetary compensation to write this post; however all opinions and ideas are 100% my own. A few months ago I made a bit of an impulse purchase and bought this 1994 pop-up camper for cheap, cheap, cheap . Well, I basically got what I paid for, because the roof was completely rotted away and needed to be rebuilt. 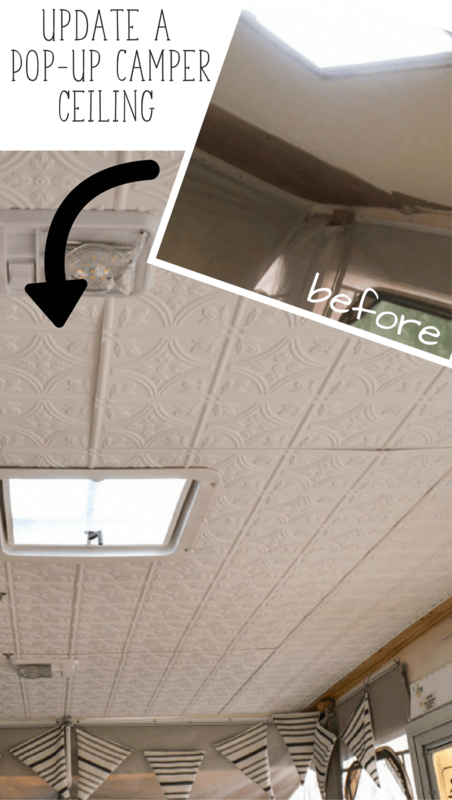 I’ll be posting some videos of that process later, but for now, I want to show you an easy way to update or refinish the ceiling of your camper (or any room in your room, for that matter!). We rebuilt the entire frame of the roof, but because the area of the roof is actually a thick layer of foam, we decided to let that dry out, completely, and then repair the interior damage in a cosmetic way. 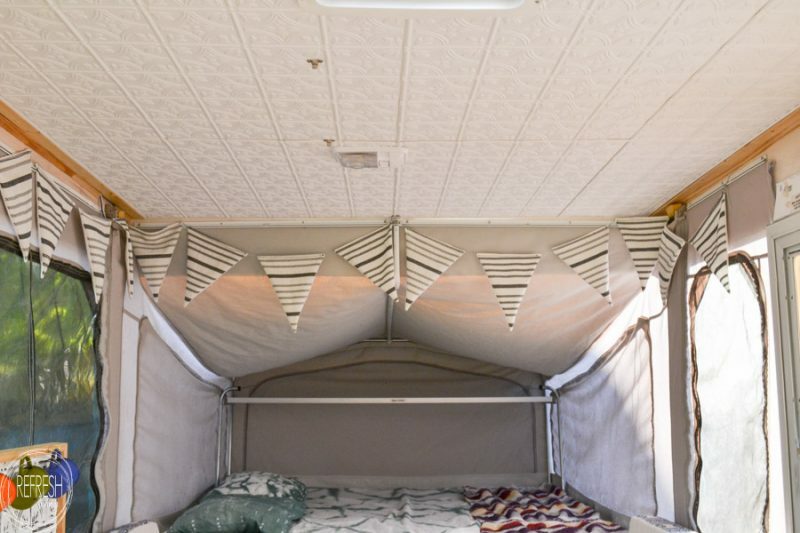 The interior ceiling of our pop-up is a thin sheet of luan that is attached to the foam. And although there was definitely water damage, we were able to peel away the rotted, damaged wood, but keep the rest of it in-tact. This piece of luan is not providing any sort of structure to the roof, so after removing the nasty, I felt comfortable just covering it up. 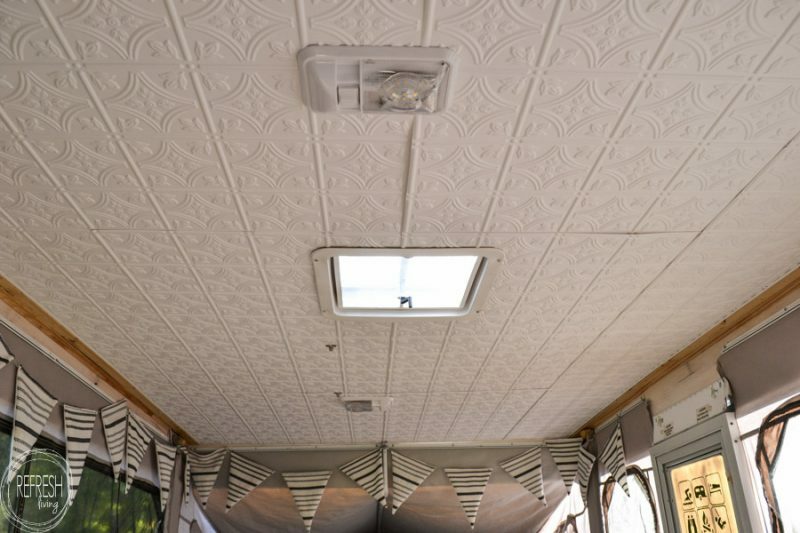 That’s when I found this product: Fascade Glue-Up Ceiling Panels. A super light-weight piece of material that can simply be glued up, and look like a painted tin ceiling? Yes, please, let’s get this little camper looking like new again! These panels are so easy to use. They can be cut with a pair of scissors, if that’s all you have on hand, and glued up with Loctite Power Grab Express Construction Adhesive. Here’s a quick tip. The company recommends using Loctite adhesive, and I would strongly agree with this. I ran out of my first tube and decided to use a different brand of adhesive that was supposedly quick grab. Let’s just say I had ceiling panels falling on my head while a few choice words flew out of my mouth. I had to grab another tube of Loctite adhesive before I could finish! It’s important to follow the instructions for planning out the layout of your ceiling first. All the instructions are provided with the product, or can be found here. I was a tad bit short on the width of the panels, so rather than buying a few more, I decided to just put up corner moulding and a strip of thin lath. I installed the J-trim around the perimeter of the ceiling with Loctite adhesive and finishing nails. 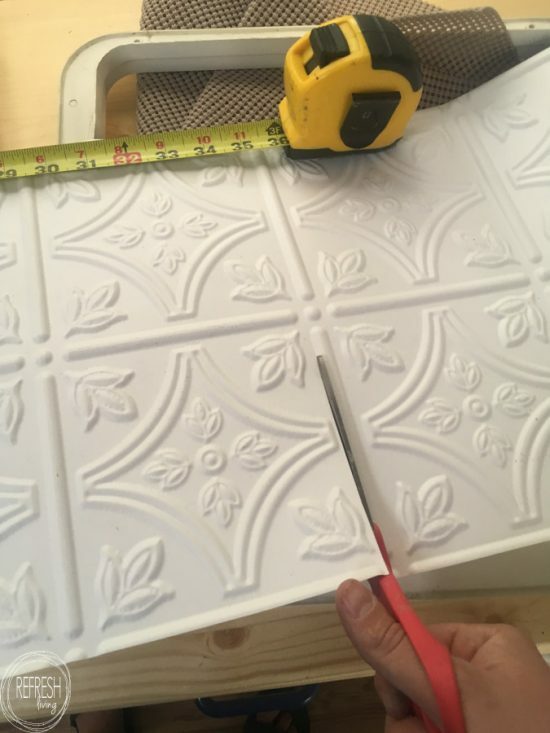 After cutting the first row to size based on the dimensions of my ceiling, I applied the panels with the adhesive and continued working until the entire surface was covered. 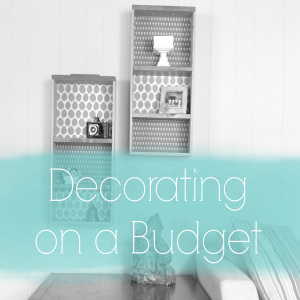 It was such an easy project, and it completely transformed the look of the space. I think it looks as good as new; what do you think? Fascade makes the same pattern of tiles, in a slightly thicker material, that can be used for backsplashes. 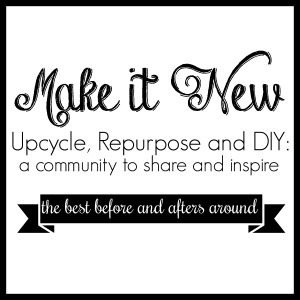 I’ll be sharing how I used them to update our little kitchen area soon! Awesome Idea! I have been looking for something to fix up and refresh my vinyl paper covered ceiling in my pop up and this looks like the best product to use. One question. Did you use the 2×2 tiles or the 2 x4 tiles, and how many did you purchase for your camper size. Hi Wendy. I used the 2 x 4 tiles, and I’m pretty sure I used 8. But, I ended up reusing some of the cut off pieces in other parts (slightly straying from the directions on the package), so I didn’t have to use extra full tiles. Have fun on your project! 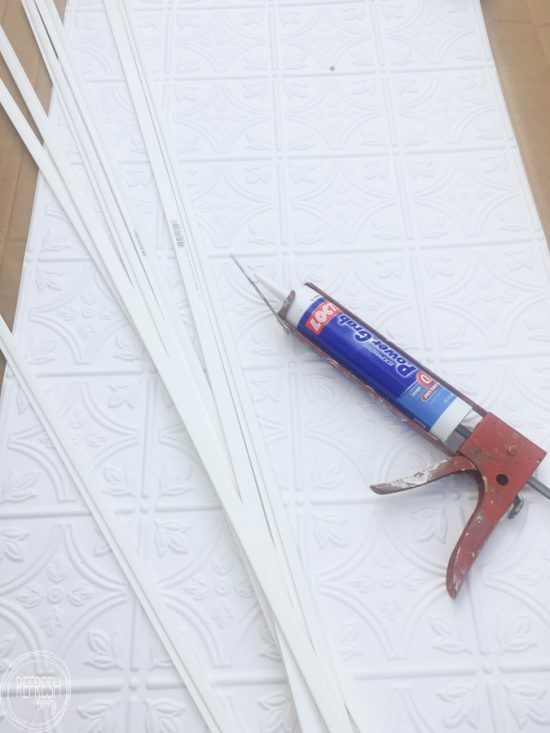 I bought them from DIYdecorstore.com – here is the direct link to the product I used. It looks like you used wood to trim between the panels and the ceiling edge. Was this needed to attach the panels or for a cosmetic look? Getting ready to clean up our camper ceiling. Hi Kolina – great question! It was totally a cosmetic thing, not necessary at all. 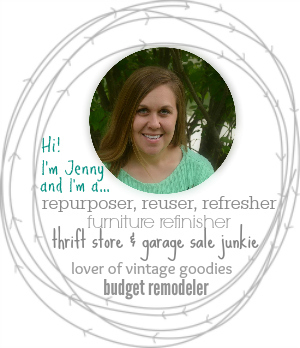 Jenny, so you removed all of the wood “sheeting” from the ceiling and the loctite power grab adhered to styrofoam? In the 8 months since your original post how has the ceiling held up? Mine has been with out a ceiling for two years because everything I have tried would melt the styrofoam. I definitely understand your problem. So I did not remove the entire sheet of plywood/luan. I just peeled off rotted layers from the one part, but I was always gluing to wood. I know they make adhesive for foam, but I’m not sure how it would hold to these plastic panels. 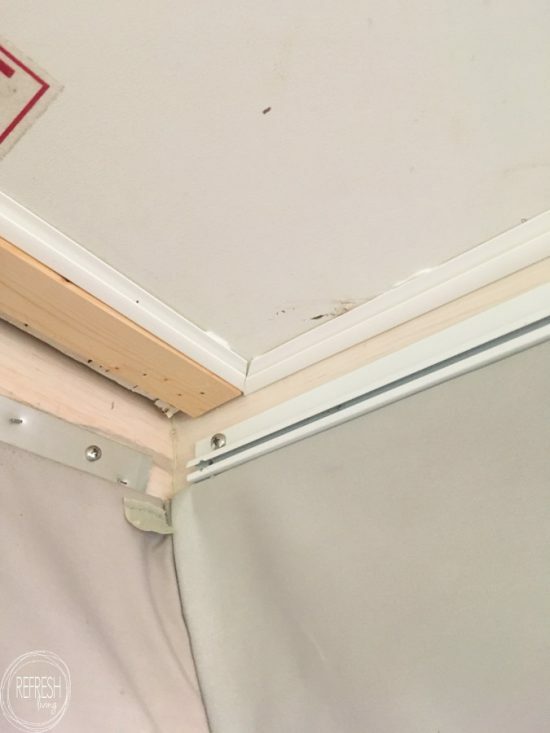 If I was in your situation, I would probably try to use thin beadboard/wood panels that I could staple to the wood frame around the outside edge of the roof (and maybe the center supports if yours has them). I’m just going off of the structure of our roof when we took it apart, so I’m sure all of them aren’t exactly the same. I think the rigidity of a piece of paneling or 1/4″ plywood might be your best bet. THen, I know you can use the foam adhesive with wood products, so you could probably glue the paneling up between the staples/screws/nails onto the foam. Not sure if that helps at all. How has this held up since you initially applied it? Has it been through any humidity? I love the look but want to make sure it stays put. Thanks! Hi Kim. It’s held up really well! The type of adhesive I recommended in the post is definitely the way to go. I used another one for two panels, and although they didn’t fall off, there were a couple of places around the edge that I needed to go up and reglue. WE’re in Chicago, so we have quite a bit of temperature and humidty fluctuations throughout the year, and it’s been stored outside for an entire year and the ceiling has held up great. Thanks for the question. I should update the post with this information! when you removed the rotted wood did you replace it or just covered it with the tile? 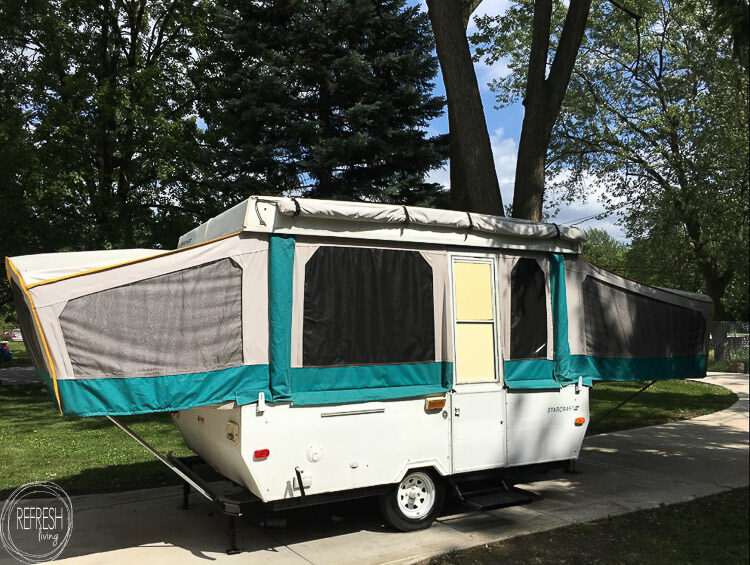 I just purcharsed an old 1985 coleman pop up trailer and looking at the same type of project. Great question. 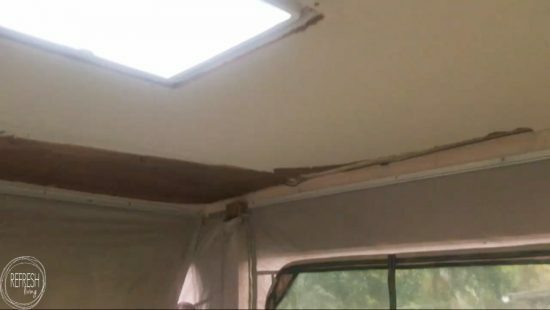 We took apart the whole roof structure and removed it from the camper to rebuild it. We had to replace the wood sides of the roof, and a couple of the 2 x 2s that ran along the top edges of the roof. Once it was structurally solid, I just kept the old plywood panel up on the ceiling and just peeled away any of the rotten layers. (I also sprayed it with a bleach/water solution to kill any mold). Because that piece of plywood was not structural, I decided to just cover it up. 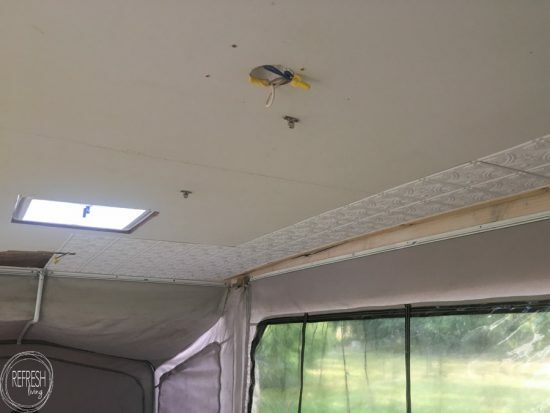 I actually plan to do a more detailed post on the process, but for now, if you go to You Tube and search Refresh Living pop up camper roof rebuild you’ll find a few videos on what we did. I hope that helps. Best of luck on your new camper! How thin are the tiles? I worry I won’t be able to latch my door back to the ceiling for storage. I have a ‘98 that looks very similar to yours, but there is not much extra space for the claps..
Hi Amanda. Great question! They are super thin. I unscrewed my ceiling brackets, installed the ceiling, and then put the brackets right back over it without any difference to how my door attaches to the ceiling for closing. It’s hard to explain, but when you hold a sheet of the tile in your hand and shake it, it wiggles and bend (maybe similar to what a piece of cardstock would do?). I hope that helps. I did the exact same impulse purchase you made with my 1991 star lite camper. I have the same roof issue, but am wondering what you did to the original shell to prevent your remodeled inside from having water damage again? I’m actually working on that post right now! I used Eternabond tape on all of the seams and underneath all of the trim. It’s holding up really well so far (2 years since I put it on).